새로운 시리즈, 김재중 여행 프로젝트가 온다! Let’s go on a #trip with JaeJoong! 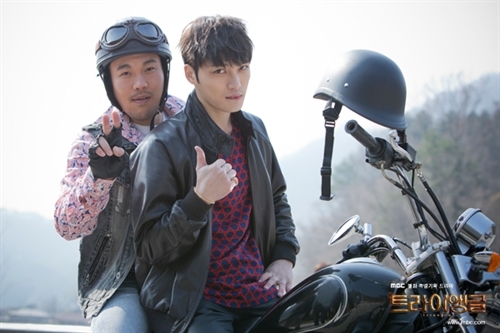 A new series starring JaeJoong as he searches for #new #destinations…Coming SOON! 재중이랑 검색으로 여행하자! 새로운 시리즈, 김재중 여행 프로젝트가 온다! #김재중 #재중 #KIMJAEJOONG #검색 #여행 #강원도로_떠나요 #먹방 #낚시 #레몬 #설악산 #운전 #불꽃놀이 #카트 #인형뽑기 #기대되죠 #저도요 #6월_12일 #TV캐스트 #네이버 #V #씨제스타그램 Let's go on a #trip with JaeJoong! A new series starring JaeJoong as he searches for #new #destinations…Coming SOON! Let’s go for 100% spontaneous travel with Kim Jaejoong on June 12th. Count me in, it’s our date! put an alarm on that date!!! I watch a lot of Kdramas, and sometimes I figure out the lead actor to be JJ 😀, I really need his drama ASAP! I can’t wait to watch this.. Realy upset about IIYO mv reupload by other channel yesterday..
Last time I checked it’s around 370k views, mistakenly deleted and all gone, what a BS! Now my question is how hard for Jaejoong and Gummy’s agency to subbed a music video so we won’t be going to 1theK channel and views won’t be split?. Other small companies like Big Hit for example, even BTS’ teaser for an MV is subbed, sigh…. Friends Ktown4u is doing great sales on their old products, one of thel JYJ’s 3 voices DVD, they’re selling it for 7$ instead of 74$ ! !